It’s Only Been 1 1/2 Weeks?! By golly, my stats are suffering! I haven’t written in what seems like a millennium, but I’m pretty sure its been a week and a half. I’ve been busy wrapping up the quarter with my essays getting more difficult, more chapters of reading assigned weekly, and math making less and less sense to me. 2 more weeks! Holy crap! Registration for Winter Quarter classes opened this morning. I thought I would have the pick of the crop, but I was surprised that damn near every English 201 online class was FULL! I settled for an online English 201 Research Paper class by a professor who was rated a B- on RateMyProfessors.com. In all fairness, he scored higher than my current English 101 teacher who has a C+. So far I have a 95% in my current English 101 class, so I’m not completely distraught. I also registered for Biology 108 – Human Biology. Another online class that fulfills my lab requirement. Biology 108 is worth 6 credits. I was going to take Biology 100, but the only online teacher available received such terrible scores on RateMyProfessors.com that I couldn’t bring myself to register for it. I will also be taking Math098 on campus Mondays and Wednesdays 5:30pm – 7:40pm. Looks like I will be keeping the same schedule for Winter Quarter! So psyched to keep my same routine, it’s actually not so bad. I’ve been keeping busy hitting my fitness and health goals. I feel like some weeks this quarter I completely let myself go and only reached 3 weekly workouts. Sometimes it’s difficult to stay on top of school and training. I’ve been making it a goal to physically GO to the gym at least twice a week, and the other 2-3 days I can choose the gym or do HIIT Zuzka videos at home. Last week I made it to the gym twice, did a killer leg session on Tuesday and an upper body, ab, and cardio workout on Thursday. On Friday, Saturday, and Sunday I did Zuzka videos at home. Holy crap her new content is KILLER! You’ll never believe it, I actually spoke with her via email directly last week! Her original website was taken over by her previous employers and re-named Sweat Factor with new trainers added. I tried it out for a few weeks but when I noticed she wasn’t posting new videos I was upset and worried. I reached out to Sweat Factor asking where she went, and they abruptly told me my membership was cancelled and Zuzka was no longer a part of Sweat Factor. I managed to find her NEW site and tried using my old login which was invalid. 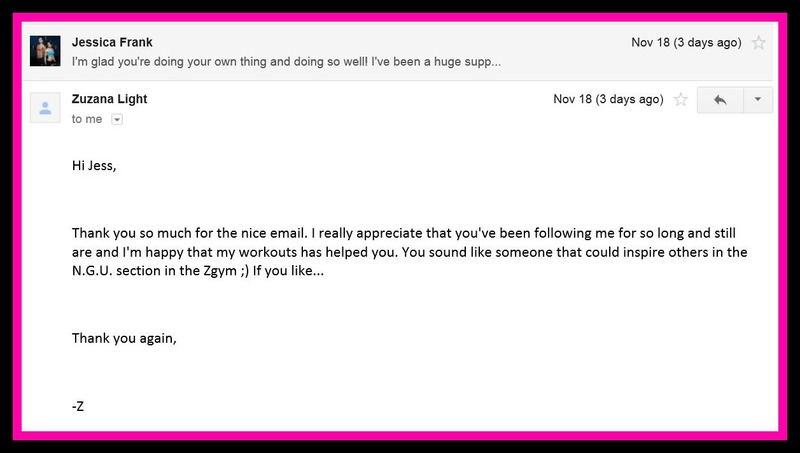 I emailed her new site and was honored to speak to Z herself! I asked her what happened and she explained the whole story about her working for Sweat Factor under a work visa, how they owned all her old content, videos, etc. Now she has her own company and I love her new website layout and workouts. I might actually get a feature on her blog too! On top of that great news, I resigned my athlete contract with Femme Nutrition and received new Peach skin tightening cream for my tush, and their new supplement line of pre-workout, carnitine, and BCAA’s! This month I didn’t receive the carnitine supplement but I received 2 flavors of their pre-workout. The Passion Fruit flavor is to die for! It gives me good clean energy without the anxiety and jitters afterwards. I used to get really bad anxiety from pre-workout like Red Line, Speed Stack, and Endo Rush. The Pineapple BCAA’s are also super tasty, I’m very pleased with the taste and quality Femme Nutrition has produced. As a sponsored athlete I receive monthly packages from them and features on their blog. 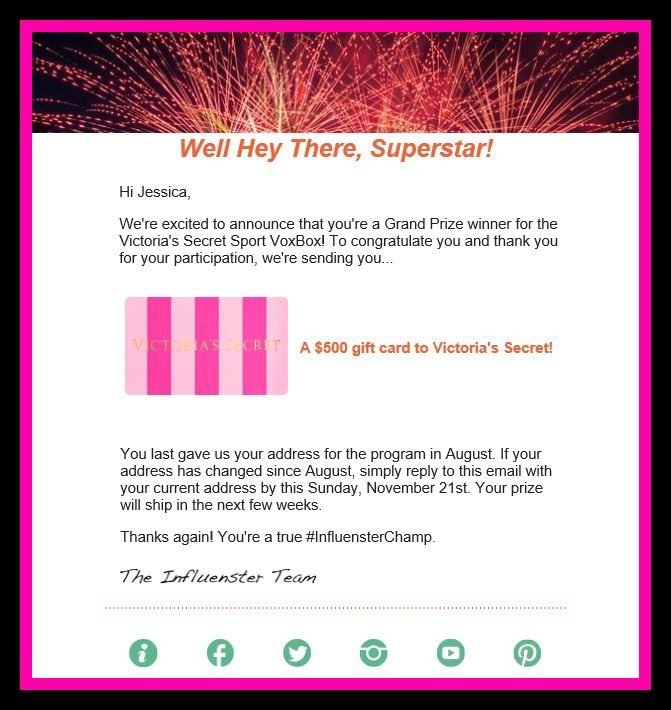 I was nominated as the lucky grand prize winner on Influenster for the Victoria’s Secret VoxBox! My YouTube Review of the Incredible Victoria’s Secret Sport Bra and workout crops landed me a $500 Victoria’s Secret Gift Card! I was absolutely thrilled when I opened the email last week! I literally had to rub my eyes to make sure I was reading the amount correctly. Apparently there were fifty $50 gift card winners and one $500 gift card winner. I feel so blessed that I was chosen! This entry was tagged abs, cardio, femme nutrition, femmenation, femmeofficial, fit, fitness, getactivewithfit, getfastwithzip, gethotwithpeach, getleanwithfirm, gift card, glutes, grateful, health, healthy, HIIT, holiday season, influenster, influensterchamp, plyometrics, prize, running, thanksgiving, training, victorias secret, voxbox, warrior z, weight training, winner, working out, workout, Zuzka, zuzkalight. Bookmark the permalink.